"The Holocaust and Genocide as Wrought By Human Beings"
Mr. Santiago de la Mora, Director of Print Content Partnerships for Google in Europe, Middle East and Africa was the guest keynote speaker at The Open University's 6th Chais Conference, held at the Open University. 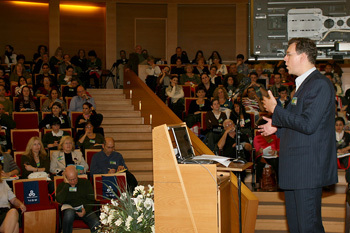 His keynote speech: "Google Books: Choice and Reach in the Internet Age" was a fitting subject for the more than 500 participants from Israel's leading universities, colleges and research institutes. According to Mr. de la Mora, at the time of the Chais Conference, there were 129,864,880 known books in the world. Within the last six years, google has uploaded 15 million books, less than 12% of the total. But, since Google's goal is to enable wider choice and wider reach, what does the future hold in terms of availability of books, formatting, learning options and technology? Technology is galloping ahead. Today, there are two billion internet users. A decade ago this figure was 361 million, a 5.5 fold increase within the space of but ten years. What is interesting here, is not so much the innovations, but rather the adoption rates. People are adopting to new technology faster than at any time before in the annals of history. It took the telephone 89 years to get 150 million users, and it took TV 38 years to reach the same number. But, it's taken a little over ten years for the same number of people to use the internet. Now with the extensive use of mobile phones -- in 2013 the number of mobile internet users will surpass the number of PC internet users -- connectivity will mean a massive transition to web-based cloud computing. Ultimately, "we are talking about making information accessible for people and bringing it together with the right user." What will the books look like? They'll be more dynamic with animations and live figures appearing to explain or illustrate a point, links to more information, maps, illustrations, and a wealth of possibilities in terms of format. In addition to the University's 1,000 books uploaded to Google Books, the University has similarly made major strides in making their own books more dynamic and reader-friendly; from E-Readers, to music books which link to musical performances, to the wealth of possibilities for integrating live appearances and animation throughout the text.